F. M. Coover was perhaps the youngest artist that created professional quality art, all before he was 17 years of age. Only three years ago, the Smithsonian, which is known for its extensive research and accurate data, had no clue who F M Coover was and no knowledge of his art. F M Coover was born Charles H. Coover in Remington, Indiana in 1887. As an illustrator, he was quite talented at a very young age. Although he was born five years after N C Wyeth, young Coover was creating near-professional quality drawings before Wyeth. He advertised as a sign-painter as well, also at the very young age of 11. His drawings and paintings, very limited in number, are in high demand for several reasons. Other than his being one of the youngest professional-quality artists known, his drawings are are extremely well done compared to any such art of his time. The drawings and paintings he left for us are very limited in number, only about 50 or so known to exist, mainly since he produced all of them over the short span of 7 years. To see this lad's art is most enjoyable and to actually own one is a rare delight. He was proficient in many types of script and lettering and had a good eye for design. When Harper's Bazaar was one of the most popular magazines, there were many famous illustrators in demand. One famous artist who also was quite proficient with pen and ink was Charles Dana Gibson. Coover was born two years after Gibson had sold his first drawings. It is difficult to distinguish Gibson's caricatures and drawings from young Coover's. Before Andy Warhol became known there was a prolific student of the arts working dilligently to perfect his pen and ink style. The drawings shown on this site were all done by that young artist, F M Coover. When you view them, remember that Coover created nearly every illustration here between the age of 10 and 16, most of them while he was 11 and 12 years of age. He could have been just as accomplished as Andy Warhol in time. He was surely just as dedicated and as talented. Things do not always work out the way we would like in this world of ours. Compare the wonderfully executed work of young Coover to the prints of the noted print-maker, George Grosz. The skill and creativity of Coover excels over any of Grosz's art! It is often only the hype that makes an artist popular. So many great artists are not appreciated until long after they are gone. Coover's art not only appeals to those who collect fine art, but also to those who collect novel art. In a way, his art has some of the appeal as that by Grandma Moses, also very unique because of her age. Coover's work is much more refined, but many collectors of caricature, advertising, and graphic art, show interest in the work by F M Coover. As Mendelssohn created very professional works of music at a very early age, young Charles H. (F M) Coover did so with art. Both lads left us with extraordinary treasures to cherish, treasures that reflect the motifs and styles of their time in history. Enjoy these scans of F M Coover's work. Most are now in the collections of those who collect primarily Indiana art, with some exceptions. For those who love art and love children, these should be a special treat for you. Note the beautiful line quality, the detail, the precision of these ink drawings and remember the steady and disciplined hand that made them was that of a young boy. 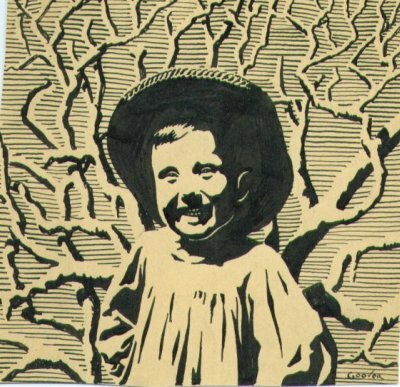 I especially love the tenderness and the design of Coover's small portrait of the child. The detail of the eyes and the teeth, so delicate. The love and the tenderness in the expression, a beautiful child's portrait rendered by another beautiful child of 12! This drawing, with the character of a block print, is a part of a collection in Paris, France. F M Coover's paintings are listed in the archives of the Smithsonian as well. Searches of various art-information sites and art forums, even those as far away as Australia, may well include examples of F M Coover's art. I have a letter dated 1899. It is addressed to Charles Coover. It would seem that a boy named Leroy Ripley knew of Charles Coover's drawings and had written to him regarding them, praising his talent at drawing. What none of us realized is that Leroy Ripley may have been the same person, Robert Ripley, who would have been a few years younger than Charles Coover. Robert Ripley became a very famous artist, traveler, and writer in the years to come. In fact, he sold his first cartoon drawing at his age of 13, which launched him on a successful career with "Believe it or Not" series cartoons, etc. He and Charles both had great talent at early ages. I wonder now what young Charles Coover thought when he heard that Leroy Ripley was on his way to fame at the age of 13. Charles would have been about 16 years of age at that time, the same age as when he made his last drawing of which we know. Would Charles have felt that fate was dealing him a bad hand? After all, another boy younger than he was now a noted cartoonist while Charles, no less talented, was being overlooked. Perhaps this was the reason we find no art by Coover that was created after his age of 16. We wonder how Charles and Ripley knew of one another. Perhaps a common relative or friend knew both. Charles did have relations in Texas, but Ripley lived in California at the time and Charles Coover was still in Indiana in 1899.